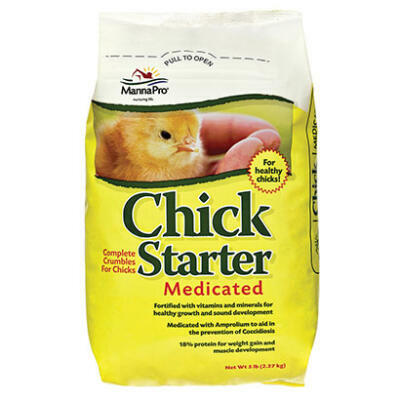 Manna Pro Organic Starter Crumbles provides your chicks, ducklings and goslings with the complete nutrition they need when they are young and vulnerable. 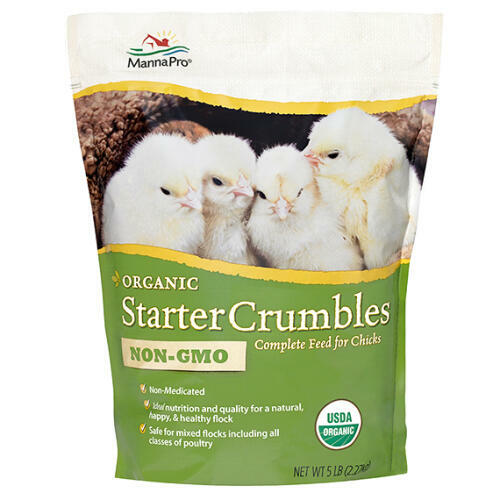 Free from pesticides, medications and genetically modified ingredients, Manna Pro Organic Starter Crumbles offers a natural complete feed solution for baby chicks without compromising on quality. Rich in protein and with nutritious, wholesome ingredients it provides the ideal start for any young flock. The feed is USDA certified and is safe for mixed flocks including all classes of poultry. Contains min 19% crude protein, min 0.9% lysine, min 0.32% methionine, min 5% crude fat, min 5% crude fiber, min 0.7%/max 1.2% calcium, min 0.7% phosphorus, min 0.3%/max 0.8% salt, min 0.01%/max 0.5% sodium, min 300 IU/lb vitamin E and min 20 mg/lb d-pantothenic acid.